A second man has been arrested in Brighton on suspicion of murdering the brother of two young men who died fighting for Islamists in Syria. Abdul Deghayes, 22, was found stabbed in a car in Brighton after a crash on Saturday and died hours later. A 26-year-old man arrested on suspicion of murder on Sunday has been released without charge. However, Sussex Police said a 54-year-old Brighton man was arrested on Monday and remains in custody. Ch Insp Andy Bennett said: "We are continuing to seek a number of people who we would like to speak to in connection with Abdul's murder." Mr Deghayes was a passenger in a VW Polo that collided with other cars in Brighton on Saturday. He died as a result of his stab wounds. He was the twin of Abdullah, 18, and brother of Jaffar, 17, both from Brighton, who were said to have become radicalised and died fighting with Islamists in Syria in 2014. His father, Abubaker, said his son had been stabbed in the back and thigh and the family, now in mourning, had suffered "a great shock". Mr Deghayes' twin and his younger brother fought for an Al-Qaeda-affiliated jihadist group in Syria, following in the footsteps of their older brother, Amer. It is believed Amer is still alive in Syria, having left Sussex in 2013. Mr Deghayes, who was jailed in 2017 for drug dealing, died at the Royal Sussex County Hospital following the crash at 21:30 GMT on Saturday near St Joseph's Church, Elm Grove. 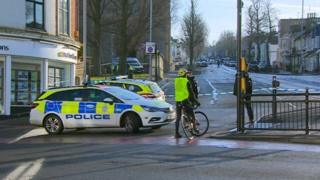 Police said there had been a disturbance in Wellington Road, Brighton, where it is believed Mr Deghayes was stabbed. Mr Deghayes then got into the car, which was driven to Elm Grove before it collided with other vehicles.